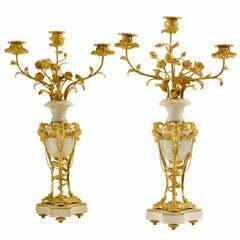 A very fine pair of Louis XVI period candlesticks of unusual form. 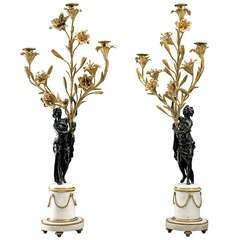 Each with an ovoid white marble body issuing a floral spray with a flower head nozzle, supported by three curved monopodiae descending from eagle heads, each with a ring in the beak, mounted on circular beaded base on three scroll feet. 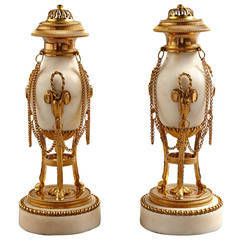 Original gilding and of outstanding quality. Kleine, leichte Wiederherstellung der Lippe des oberen Marmor Element. 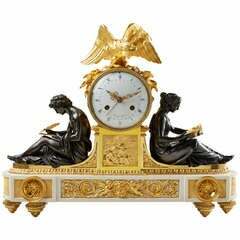 Paar französische Applikationen in Ormolu Louis XVI, 18. Jahrhundert. Paar hohe Kerzenhalter aus dem 18. Jahrhundert. Alles original Finish und Struktur. Einer der Kerzenständer neigt sich nach rechts. Schöne Schnitzerei und alle Originalfarben.